ebm-papst Group has acquired Lae Srl, a specialist in fan guard grills for an undisclosed sum, retroactively effective from 1st January 2017. The move means that ebm-papst has increased the vertical range of manufacture for its safety-relevant components used in ventilation, cooling and air conditioning applications. Established in 1973, Lae has around 100 employees and an annual turnover of almost €10m. 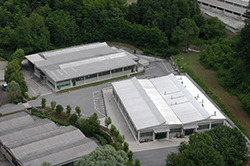 With headquarters in Caravate, near Milan, the company will be assigned to ebm-papst Srl, the group’s Italian subsidiary, also located near Milan.